Updating “Because I Said So” – Four things to say instead. Whether we’re talking about closing the front door, making a replica of the Alamo out of salt dough or cleaning poor Goldie’s dirty tank, we all know it shouldn’t take threats, bribes and every-three-minute “reminders” to get our kids to complete their responsibilities. So why does it? One thing is for sure: “Because I said so” doesn’t apply to this generation of savvy-yet-stubborn kids. And millions of parents are at their wit’s end trying to figure out how to get the cooperation they’re looking for. The truth is, the authoritarian “Because I said so” method of parenting is on its way out. Collaboration and respect are replacing the top-down dominance of the previous generation. Just like husbands can no longer demand dinner on the table when they walk in the door from work and bosses can’t berate their employees for walking in five minutes late, parents shouldn’t depend on pure authority to get kids to toe the line. We can attribute these changes to big societal shifts, seen everywhere from CSPAN to social media, and they’re not changing back anytime soon. Our kids see us respectfully negotiating with other adults all over the place, from the dinner table to the doctor’s office to the business calls we take at home. The reign of cooperation has changed everything when it comes to parenting our kids, which is why “You’ll do it because I told you to” and “Just wait until your father gets home!” won’t get our kids to jump into action. What’s more, teachers and coaches treat kids with respect and in turn, children perceive that this type of communication should be the norm – even at home. Because of these societal changes, demanding compliance and depending on “Because I said so” will fuel more power struggles than most parents ever bargained for. The good news is that we can still help kids clean up their acts as long as we shift our parenting techniques. 1) “When…Then…” The good news is we can get our kids to do their jobs in a timely manner—before their favorite show, for instance, without barking orders. Instead, phrase your requests by saying, “When you’ve cleaned the trash out of the car, then you may enjoy your media time for the day.” Then, completely ignore the grumbling to avoid a power struggle. Say it the same way every time (“When you’ve finished all your math problems, then you can go outside with your friends”) and soon your kids will leave the couch in a more timely manner and actually complete their responsibilities. 2) “Anything you can do to…” If there’s one thing that drives kids crazy, it’s being bossed around, and can’t we all relate? Instead, invite cooperation by sticking to respectful phrases when you could use a hand raking leaves or packing for the beach—the type of thing you’d say to your coworker. Say, “Anything you can do to help us get ready for our beach trip would really be a huge help,” or, “Who can help me rake all these leaves into a giant pile before it rains?” Although you’re not always guaranteed to get the help you’re looking for with these types of phrases, when your kids do pitch in they’ll feel much better about contributing on their terms, and will be more likely to do so in the future. 3) “What’s your plan for…?” Why does it always seem that we’re more concerned with the Gettysburg diorama due on Friday than our kids are? To ward off a week’s worth of nagging about it, instead simply ask, “What’s your plan for getting your diorama done in time?” In addition to being more encouraging (it assumes they have a plan in place), this puts the ball firmly in their court, and gets them thinking about ways to get the job done, no nagging necessary. 4) “Asked and Answered.” This tool, from Lynn Lott, MA, MMFT and co-author of the Positive Discipline series with Jane Nelsen, EdD, effectively stops whining in its tracks. When kids whine about your decision not to allow them to roller skate in the living room, for instance, respond with, “Have you heard of ‘asked and answered?’” Then briefly review the question and answer (“Did you ask me if you could roller skate in the living room?” “What was the answer?”). Next, ask, “Do I seem like the kind of parent who would change her mind when you ask me the same thing over and over?” At this point, the child will probably protest, roll her eyes, walk away, or a combination of these. Ignore it. From now on, anytime your child repeats a question you’ve already answered, simply say “Asked and answered.” She’ll quickly get the point and stop whining so much. Even though we’re living in a more cooperative age, remember that you still hold the authority as parent. You’re simply more likely to get cooperation rather than pushback if you seek solutions and invite cooperation rather than handing down orders. And when you do have to put your foot down? It won’t feel as heavy if you haven’t already done so a dozen times that day. Enjoy the new era, and try out some of these phrases on your kids today. Chances are, everyone in your home will be happier—and more cooperative—without “Because I said so!” ever crossing your lips. 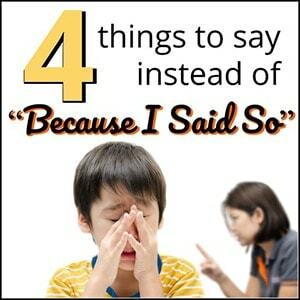 Looking for more strategies to use instead of “Because I said so…” – join our FREE parenting webinar: Get Kids to Listen Without Nagging, Reminding or Yelling. Find dates and times here.